Unique moments photography of Gig Harbor Washington captured this image 4 yrs ago and it remains one of our favorite mother daughter images. 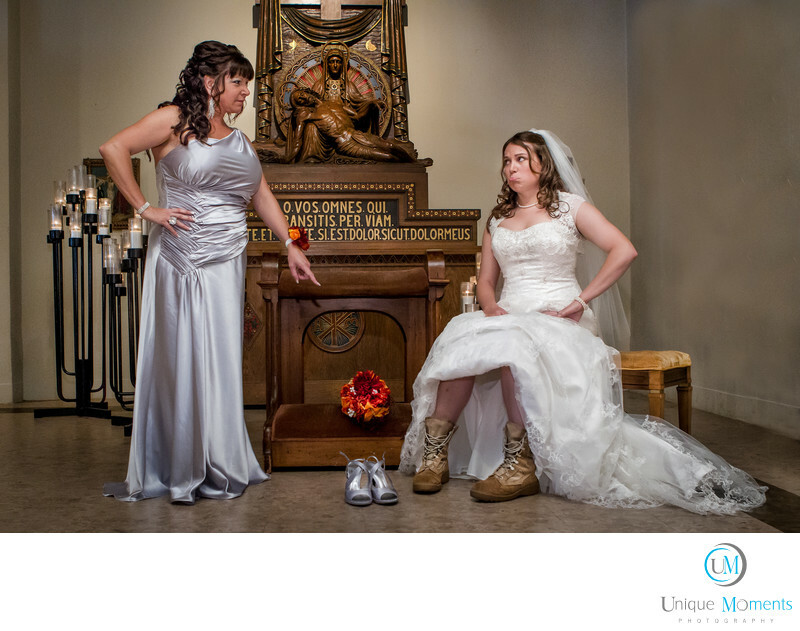 The bride was an active US Army soldier and she initially wanted to wear her combat boots under her wedding dress. Her mother said No way. So, we asked her to bring the boots to the wedding as we had a little idea for a fun shot. We told mom about the idea and this was the end result. Yup, absolutely this was a 100% staged shot. But it had a real story behind it and everyone thought it would be a fun shot to try. Both Mom and daughter nailed this shot. Definitely fun and it made her album. We are very open to creating fun images for your wedding. If you think you have an idea that might work, lets discuss it and make it happen.Weddings are supposed to be Fun.